When you first get your triple jump athletics facility installed, it’s imperative that you make sure you have all the correct triple jump runway equipment with it. Each piece of equipment is designed to make the surface safer for those who use it – this is vital for schools who have a responsibility to look after the children using it. The first piece of triple jump runway equipment we offer is a sand pit cover. The sand pit cover is essential for making sure that no contaminations find their way into the sand pit, things such as twigs and leaves can ruin the sand surfacing, and also make the impact from landing into the sand pit more dangerous. 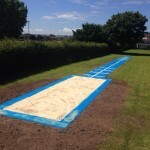 We also offer a sand pit rake, this piece of triple jump runway equipment is important in removing the contaminants that can cause damage within the sand pit, it also makes the layer of sand smoother to help record accurate results during competitions, ultimately improving the playing characteristics of the surface. If the surface is being use specifically for competitive use, you will need a take-off board; this is the most essential piece of triple jump runway equipment when the sports facility is being used for competitive events. The final piece of triple jump runway equipment we offer is the line marking repair kits, this gives you the ability to repair and maintain your own triple jump surface, which ultimately will help keep the costs to a minimum. The triple jump accessories costs will vary depending on a variety of factors. 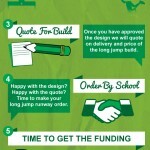 The main factor for working out the price of a sand pit cover is the size and dimensions of the actual sand pit. As obviously the bigger the sand pit the bigger the cover will have to be to protect it. However these triple jump accessories should be seen as an investment, as similarly to a thorough maintenance scheme it ensures that the surface remains entirely safe and suitable for use throughout its product life and it also means that the life expectancy of the triple jump facility as whole will be longer. We always suggest taking into account a maintenance plan and maintenance equipment into your budget to ensure that you get the most from your sports facility. We aim to offer the best quality products and services for the most competitive and flexible prices – this allows clients to stick within their budget, whilst also giving them the best value product we can offer.